Of Seattle died February 28, 2019. She was 88 years old. Rita was born July 24, 1930, in Buffalo, NY, to the late John and Barbara (Prelewicz) Gabalski. She attended Queen of Peace Elementary School and Villa Maria High School in Buffalo. She then attended Our Lady of Victory Hospital nursing school in Lackawanna, NY, where she received her training and certification. Rita was studying for her nursing degree at St. Louis University when she met the love of her life, Leo Eilert Heye.They were married on June 10, 1953, in Buffalo, NY, and returned to Seattle where they eventually settled in the Mount Baker neighborhood to raise their children. Rita was devoted to her family and community. She volunteered at St. Mary's School in the Central District while her children attended school there. 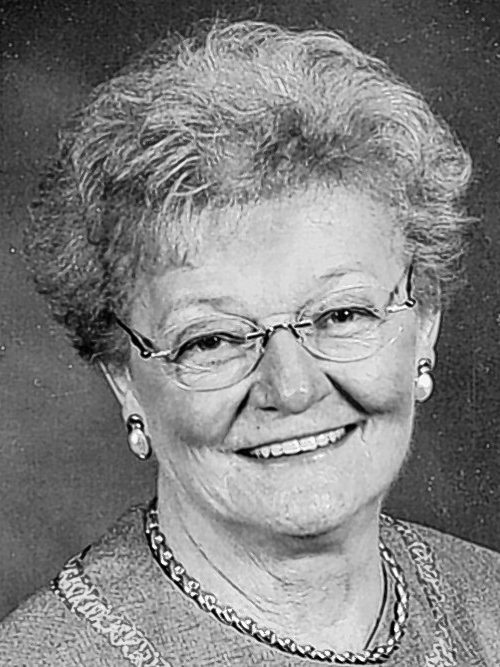 She was active in the Boy Scouts of America as her five sons earned their Eagle Scout rank with Troop 200, Thunderbird District, and served as the Troop's Treasurer for decades. She and Leo were members of Our Lady of Mount Virgin Parish where she sang in the choir, volunteered in the parish office, and served as a Eucharistic Minister. As a member of the Anna Donahoe Circle, Association of Catholic Childhood (now Advocacy and Caring for Children) for more than 55 years, she sold license plates at the Foodland Store on Capital Hill, volunteered at the Circle's annual fundraising luncheon and served as the Circle Treasurer for many years. Rita and Leo enjoyed family summers spent at their cabin in Columbus Park in Olympia and year-round working at "The Farm" in Renton. Early family vacations were spent camping east of the Cascade Mountains with an array of friends, kids and horses. Much to Rita's delight, later vacations included more comfortable trips in a motor home or at destination locations around the world. Rita loved to sing, dance, garden and sew, and cooked for her family of nine with ease. She was preceded in death by her husband of more than 50 years, Leo; brothers, Reverend Monsignor John, Edmund and Eugene Gabalski; and granddaughter, Stephanie Lamothe. She is survived by her daughters Cynthia Lamothe of Seattle and Sally (Ivan) Turner of Bothell; sons David of Algona, Daniel (Diane) of Kenmore, Robert of Clackamas, OR, James (Nannette) of Bellevue and Richard (Susan) of Auburn; 13 grandchildren; two great-grandchildren; and her sister Dorothy Witkowski of North Tonawanda, NY. The family wishes to thank caregivers Maria and Nidhi who helped Rita tremendously. In lieu of flowers, donations may be made to Advocacy and Caring for Children, 100 23rd Ave. S., Seattle, WA 98144 or St. Martin's University, 5300 Abbey Way SE, Lacey, WA 98503. Visitation is at Columbia Funeral Home from 7:00 to 8:30 PM on Thursday, March 28th, followed by a Rosary at 8:30 PM. Funeral Mass is Friday, March 29th, at 10:00 AM at Our Lady of Mount Virgin Church, 1531 Bradner Pl. S. in Seattle.